You can start saving now by using 10 simple ways to lower your homes water bill. Instead of running tap water until it gets cold, store a pitcher of it in the fridge to use when needed. Adversely, when needing warm water, just boil it, versus waiting for the water to run warm. Try to limit your shower time to 10 minutes or less. Also, try turning off the water in between rinsing and soaping your hair and body. A tankless water heater only heats up water when it’s being used. This not only reduces the energy of keeping an extra 40 to 50 gallons of water constantly heated, but it also allows for a minimal amount of water to be used more efficiently. If you have a yard that has living plants or grass, most of those things need water to survive. Try setting your watering schedule to only one or two days per week. You can waste up to a gallon or more per day just by letting the water run when brushing your teeth. Turn it off while brushing and use water only to rinse. A low-flow shower head is anything with a flow rate of less than 2.5 gpm. This is a simple change that can make dramatic effects on your water bill, especially for those who love long showers! Find them at your local hardware store. If you have the means necessary, a fantastic money-saving upgrade is to install low-flow toilets in your home. A normal toilet uses approximately 1.6 gallons of water per flush, whereas a low-flow toilet only uses 1.3 gallons per flush. Waste not, want not. Take full advantage of a full washing machine, as well as a full dishwasher and only run full loads! Not only is hand-washing dishes time-consuming, but it’s also a water-waster! Dishwashers (especially more modern Energy Star certified brands) are meant to optimize both water and energy efficiency, saving you money in multiple ways! 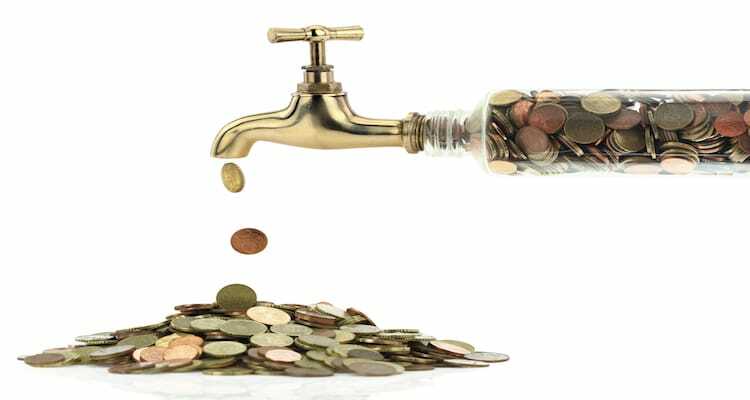 Check all faucets for leaks where you may be dripping money down the drain! Also, consider installing a simple aerator that helps cut back on the amount of water that flows through the faucet. Or, you may opt to purchase a WaterSense-certified faucet. Either way, you can’t go wrong! Start simple! This is just a short list of 10 initial ways to lower your homes water bill, but there are plenty more things around the house that can be done! Every home varies, but by making a conscious effort to cut back on your water flow, your water bill can significantly decrease, and your wallet will thank you!